Being the captain of the ship and running a business is almost the same thing. Looking out for those ice-bergs by steering your ship away from potential sea disasters while assigning tasks to all the other ship mates and checking on the running machineries and lubricants ….and phew! I’m already tired. But in spite of all that, the ship has to sail isn’t it?! So this is what we call multitasking, you’d know it already if you’re an entrepreneur. Sending an email while driving, signing documents while on a conference call, assigning work while eating lunch and at the end of the day, you’re smiling and patting yourself over the work done when you suddenly realized you mailed the wrong person, signed a contract you vowed never to and assigned unimportant tasks. Basically someone who coined the word “multitasking” didn’t really think it through. If there’s anything that multitasking does, it only skews up your priorities and slows up tasks without you realizing it. Instead of getting more things done quickly, it only jeopardizes your chances of completing a task. But unfortunately, entrepreneurship has become synonymous with the word. If you don’t multitask then you’ll never get work done. This is a myth. Well some may say just the opposite; they seem to get things done faster by multitasking. Mr Art Markman, a cognitive psychologist and author of “Smart Thinking” has discovered in his research, that effective multitasking is an oxymoron because “the human brain doesn’t really multitask”, he says. But I handle multiple tasks at the same time, you may argue. What you really are doing here is “Time sharing” wherein you assign and focus on one task every couple hours. But however, even when you’re time sharing or multitasking, you still seem to miss out on many things just like the eggs you went shopping for but returned with everything except the eggs! It’s natural to open the mail wanting to read a mail from a certain Mr.A but end up checking the holidays pics of Mr.Z. Time-sharing or multitasking, somehow the scheduled tasks never complete as we schedule. Re-scheduling takes up even more time than actually doing the work. Keep things where they should be. De-clutter your desk and throw away things mercilessly that shouldn’t be there. They say, how you keep your little things speaks volumes about how you can manage the big ones. Yes. Go hour by hour. You know how your business works. Make morning hours only about working, don’t bother calling clients or anyone. Just do pure work. Return your phone calls, reply to mails, send official letters etc in the evening. Once you’ve established this trend, people will adapt themselves to your schedule instead. This saves a big chunk of re-working later and also since it’s related your brain will not take time in processing information. If there are unrelated tasks such as working on a new contract and meeting other clients, schedule it in parts. Our brain can only take in little information at a time and the normal human tendency is to forget it right the second you’re busy on another project. Always remind your brain what you’ve in store for the day and tune your mind into “I won’t leave office without doing this” resolution. Make sure to write your everyday to-do list and keep it at a visible place. A research points out that today people spend hours on FB and minutes actually working. The distractions have become a part and parcel of our life. Word to the wise. Keep the distractions at bay and prioritize your tasks. Once you’re done, reward yourself with some social media time. Multitasking is an overrated word and its effects on the brain are upsetting. “The conflicts triggered by incessant multitasking can set off chronic stress and slow you down, shredding productivity. In fact, trying to complete two or more tasks at once can take 50 percent more time or longer, depending on the complexity of the tasks” Meyer says. You’ve tried multitasking; now start focusing on one task. You’ll see it’ll make all the difference. "Multitasking Is A Modern Day Myth. 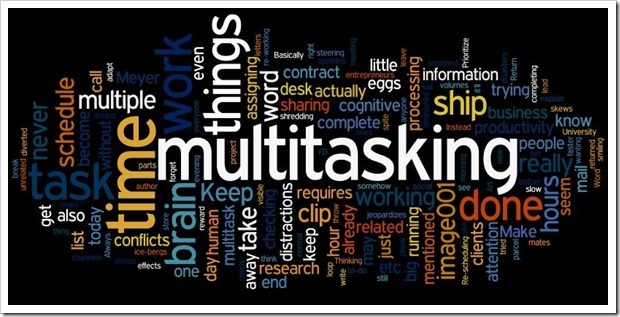 To Get Things Done, Stop Multitasking And Start Focusing", 5 out of 5 based on 1 ratings.